The laundry room does not have to be a dingy, dirty room that you hate to be in. You spend a lot of time doing laundry, so you may as well do it in a room that you enjoy. 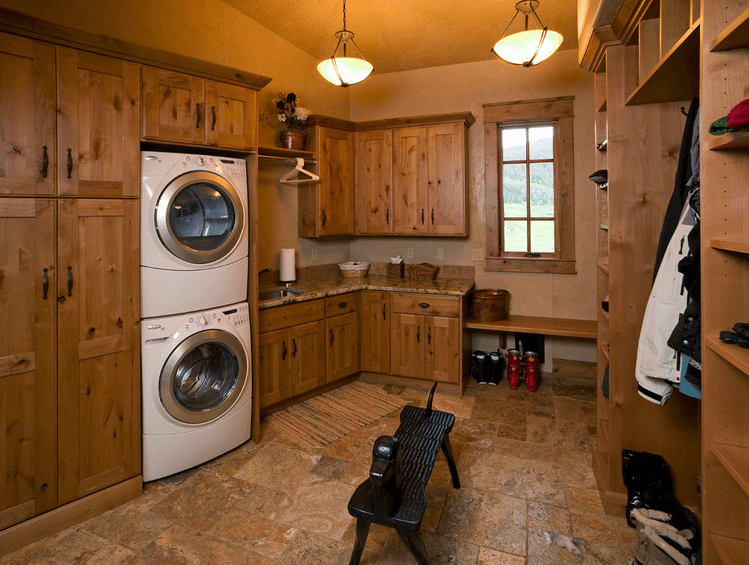 One of the trends in home design is to incorporate large laundry/mudroom/storage spaces. You’ve got opportunities that you can take today to make your laundry room a place that you, and maybe even the rest of your family, want to spend time in. If your machines are older models, they are probably not energy efficient. Getting energy efficient machines will not only replace older eye sores, but will also save you money in the long run because they will use less energy. Don’t rush into buying new machines. Shop around and ask for friend’s opinions and recommendations to find ones that will work for your needs. You can make the laundry room a place you don’t mind going to by making it more inviting. Laundry rooms are usually small, so you don’t have to worry about the cost of painting being high. 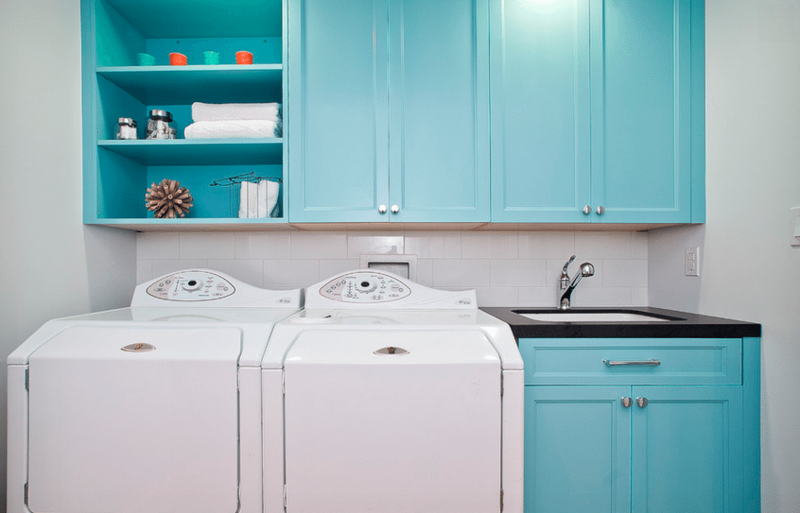 Choose a color that you love so that the laundry room is inviting. Most laundry rooms have the standard shelf. Add multiple shelves or cabinets to store detergent, pins, and other items you keep in the laundry room. Rather than having bulky boxes and mismatched trays, try using clear jars for detergent so that you know when you need to refill or use matching baskets to hold those laundry room necessities. If your laundry room is lacking storage, now is the perfect time to add shelves to fit your organizational needs. Paint the walls before you add new shelves to make the painting easier. You may also want to put laundry bins in your laundry room for sorting out loads of laundry. Look into adding a base beneath your new washer and dryer for those laundry baskets to hide in. Keep your laundry room tidy by not using it as a storage room for other things unless they have their own space in the room. You don’t want clutter from other areas of the house taking over your lovely laundry space. Chances are the lighting in your laundry room isn’t ideal. If you want more light or less light, it’s a fairly easy change that will make your laundry room better and more functional. Too bright light bulbs can give you headaches, but you also want lighting that isn’t too dull. Try out bulbs with different wattage until you find what works. The flooring in laundry rooms tends to be concrete, vinyl or linoleum. You can add better flooring that is more comfortable and better to look at and is still waterproof just in case there are leaks. Functional flooring can still be good-looking. If you have a dull and dreary laundry room, it would be a wonderful area to improve. We all have to do laundry, but we don’t have to be miserable doing it. When it comes time to sell your home, if you ever decide to, it will also make a good impression on potential buyers.